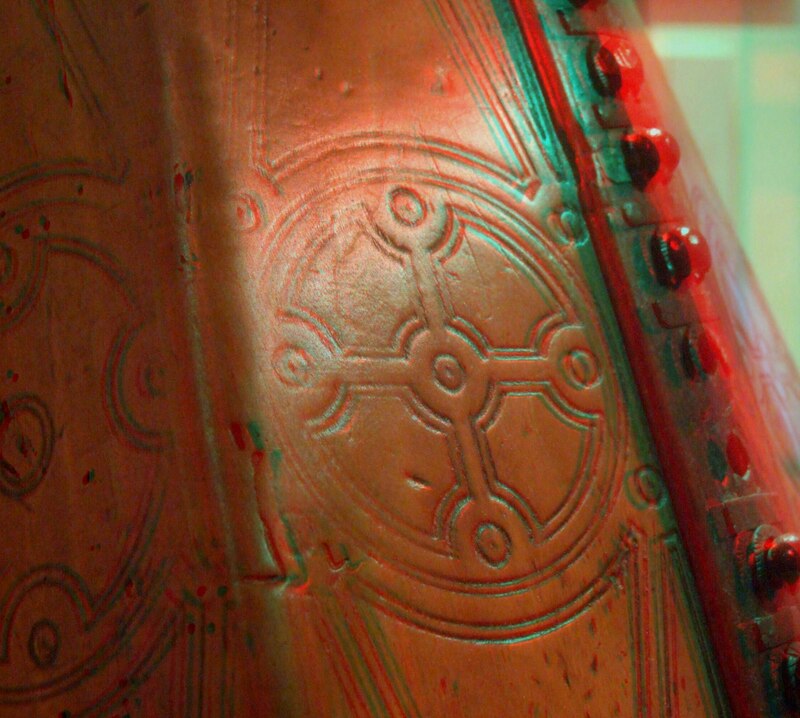 3D anaglyph image, red/cyan goggles required for viewing. The soundbox of the Queen Mary harp bears dark lines in geometric shapes - circles and diagonal lines. The scheme is comparable to the harp shown on the Keills cross slab, and also to the decoration on the soundbox of the Trinity College harp. A detailed drawing and analysis of the soundbox decoration was published by R.B. Armstrong in 1904 (click picture to enlarge). Most scholars (including myself) have repeatedly asserted that these soundbox lines are burned with a hot iron. However I am starting to doubt this assumption now. It is not clear how these lines were made. They seem to be impressed into the surface of the wood. The back panel of the soundbox, which is a press fit, and which is made from a different timber, has the same kind of impressed darkened lines on it. There is a kind of purple colour over significant areas of the soundbox but I am not sure whether this is the remains of a painted colour scheme, or just a layer of old varnish or dirt. The soundbox also bears the brass string shoes. These are of two types, and are fairly simply made from bent and hammered brass wire. Groups of nails in the soundbox may be the remains of decorative plaques. 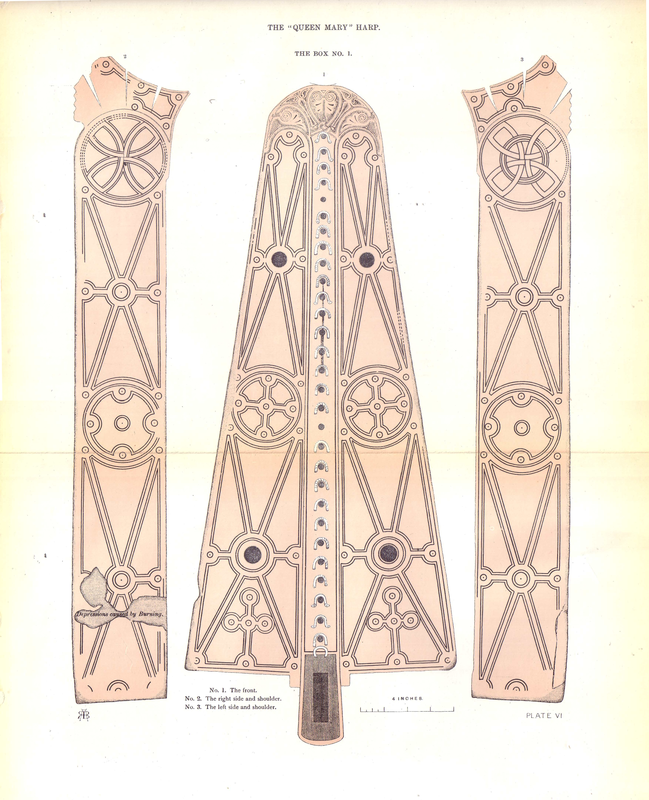 The top end of the soundboard, the section shaped like eyebrows, is carved in relief with 15th century West Highland foliage designs, matching the foliage on the forepillar (picture from PSAS, vol XV). The projecting block at the base of the soundbox is carved as an animal head with bared teeth.